Y Striders club turned 20 this July and of course a celebration was in order. It normally doesn’t rain on Y Striders but last Sunday was the exception, it bucketed down. Members assembled at Attadale Primary school to board the bus for a mystery lunch destination. Possible lunch spots were tossed around and ruled out as the bus turned north up the freeway then east through the Polly pipe, the driver even did a pirouette around a round-about. Finally, still in pouring rain we arrived 100m from our destination and a mad dash was needed to reach the restaurant, The Vineyard Kitchen in the Bickley Valley. Before sitting down to a 3-course lunch Ken challenged us with a game which involved mingling around with a half page piece of paper from a magazine trying to find the person who had the other half. Between the noise from Y Striders and the rain on the tin roof the noise was deafening and I’m sure staff must have wondered what kind of afternoon they were in for. 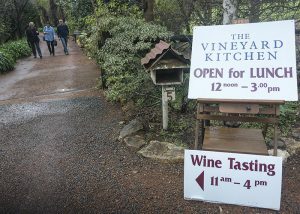 The food and wine were excellent and many people are planning return visits in warmer weather. Many thanks to organisers, Ann, Elizabeth, Ken and Julie B for putting together a great afternoon.